From the New York Times to the Colbert Report, liberal media commentators have had a field day bashing Glenn Beck for his purported conflict of interest in encouraging his viewers to invest in gold without disclosing that he has endorsed gold distributors. Yet few of these pundits have even mentioned Al Gore's monumental conflict of interest--which could have far greater consequences for Americans than Beck's gold promotions--in touting global warming hysteria while establishing his own green technology empire. 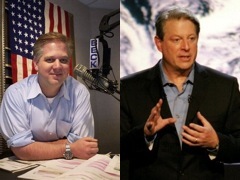 NewsBusters has consistently argued that Gore plays up the dangers of global warming to line his own pockets. His investments in green energy firms could pay enormous dividends if the United States adopts the draconian cuts to carbon emissions he has advocated--and Congress included in the environmental tax known as cap and trade passed by the House last summer. Last year Mr Gore's venture capital firm loaned a small California firm $75m to develop energy-saving technology. The company, Silver Spring Networks, produces hardware and software to make the electricity grid more efficient. The deal appeared to pay off in a big way last week, when the Energy Department announced $3.4 billion in smart grid grants, the New York Times reports. Of the total, more than $560 million went to utilities with which Silver Spring has contracts. The move means that venture capital company Kleiner Perkins and its partners, including Mr Gore, could recoup their investment many times over in coming years. Critics, mostly on the political right and among global warming sceptics, say Mr. Gore is poised to become the world's first "carbon billionaire," profiteering from government policies he supports that would direct billions of dollars to the business ventures he has invested in. Many in the media have accused Beck of failing to disclose a similar conflict of interest. Yahoo News reported on commentators' accusations of "a blatant conflict of interest concerning his frequent on-air promotion of an investment sold by one of his main advertisers: Gold." The Post-Chronicle reported that "Beck has openly endorsed his sponsor on his radio show, and radio hosts are permitted to endorse on-air with FOX. But the fussy objection is 'live reads' vs. 'spokesmanship' which is calling into question whether Glenn Beck can be objective on stories about gold." Radio and TV host Glenn Beck likes to talk about the potential collapse of the American economy. He also likes to talk about buying gold as a hedge against the unknown. The proximity of those ideas, the plethora of gold ads around his Fox program and Beck's work as a paid pitchman for one gold firm have some in the media wondering whether the conservative commentator has a conflict of interest. Since conflicts are in the eye of the beholder, Beck should consider himself lucky if the public doesn't judge him by the where-there's-smoke-there's-fire standard he uses to condemn his own adversaries. As long as we're on the topic of hypocrisy, where was the Times's criticism of Gore for pushing an agenda that could radically alter Americans' everyday lives while potentially making him a billionaire in the process? To paraphrase the Times's report, the proximity of those ideas--Gore's deep involvement with a venture capital firm investing in green technology and his relentless and high-profile calls on the world to abandon fossil fuels and invest heavily in such technology--has some (though apparently few in the media) wondering whether the eco-prophet has a conflict of interest. The Times, like many other liberal media outlets, jumped at the chance to attribute Beck's warnings of a flagging dollar to naked, money-grubbing self-interest. Yet, according to Nexis, they have not even mentioned Al Gore's colossal conflict of interest. Does Gore actually believe that the world is on the verge of catastrophic damage from global warming, and does he invest in green technology because he thinks it's a sound investment? Maybe. But by the same token, couldn't Beck actually believe that the dollar will collapse, that gold is a safe investment, and that he should promote it to his viewers for these reasons? It is only appropriate for Beck to disclose his relationship with Goldline, a prominent gold distributor, when he lauds the company's product on air. And he has done just that on numerous occasions. On November 12, Beck interviewed Goldline president Mark Albarian. He stated right at the outset: "Full disclosure here. This is my, this is my gold guy, but my gold guy happens to be a sponsor of this program. So I want you to understand clearly going into this that this is a sponsor of my program." During his December 11 show, Beck stated, "Full disclosure: Goldline is a sponsor. That's why I'm telling you this is a paid commercial." Beck does not disclose his ties with Goldline along with every statement he makes supporting gold investments, but he has informed his viewers of his relationship with the company on multiple occasions. Gore has also, on occasion, acknowledged his financial interests in the agenda he pushes so vehemently. He has stated, "I am proud to put my money where my mouth is for the past 30 years. ... I absolutely believe in investing in accordance with my beliefs and my values." It stands to reason that he would encourage others to invest according to those beliefs (in global warming and the wisdom of "green" investments) as well. If Beck and Gore wish to tout dire visions of the future to trumpet products in which they have financial interests, they should absolutely disclose those interests (and both have, though neither has consistently). But if commentators believe so fervently that Beck's relationship with the gold indsutry sullies his calls for investments in the metal, they must also acknowledge that Gore's calls for alternatives to fossil fuels are suspect due to his ties to the green energy industry. If Gore is to be given the benefit of the doubt, so must Beck. To condemn Beck but not Gore is sheer hypocrisy, especially when the latter has far more world-wide political influence to directly aid to wield on behalf of his business interests. At most, Beck is making a few million off his advocacy. Gore on the other hand stands to make billions? Don't count on Beck's critics seeing that disparity either.